MamaEatsClean: My Little Man is One - A few Mustaches, a Couple of Tears , and an Egg Free Take on the Betty Crocker Gluten Free Devil's Cake Mix. 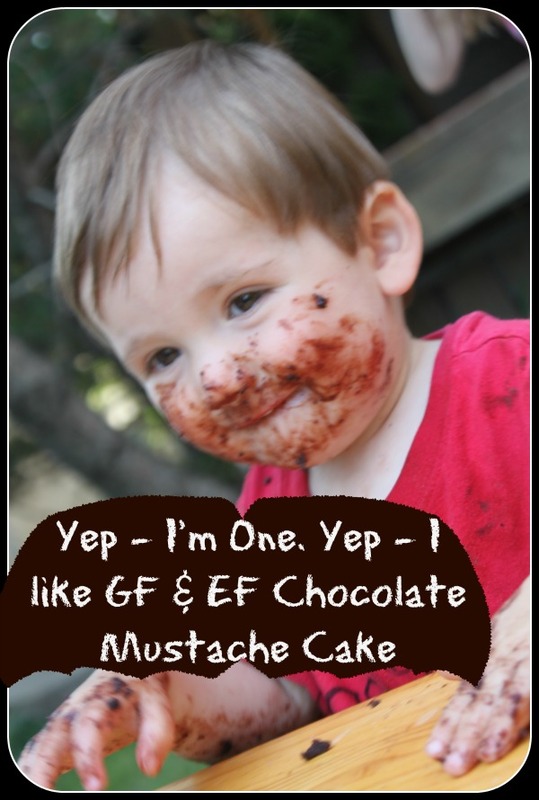 My Little Man is One - A few Mustaches, a Couple of Tears , and an Egg Free Take on the Betty Crocker Gluten Free Devil's Cake Mix. Today my little man (now referred to as Big Boy) turned ONE. Happy Birthday my playful, fun, busy Big Boy! We let him go to town on the cake. The benefits of a summer birthday. This would never happen in the house! I'm finding it a very emotional milestone. I don't remember feeling this way with the girls. Not sure if it is because he is my last one. Although I'm sure the 250 people at my brother's wedding think I'm pregnant because I refused to drink a shot of Anti-candida diet Tequila. Or he has just been such a blessing. Not only because he is a fun guy. Which he is. Very playful. Always ready for a quick laugh. But because he just completed our little family. I felt an instant sense of peace when I had him. He was the missing piece of the puzzle. When he was about two weeks old a relative of my Mom's (which I had never met) said "you don't look like you just had a baby - my wife was so tired all the time". Its because I was beaming. I still remember my Mom saying "Its because she's happy". I didn't really have time to think about it. But yeah. I was. I am. 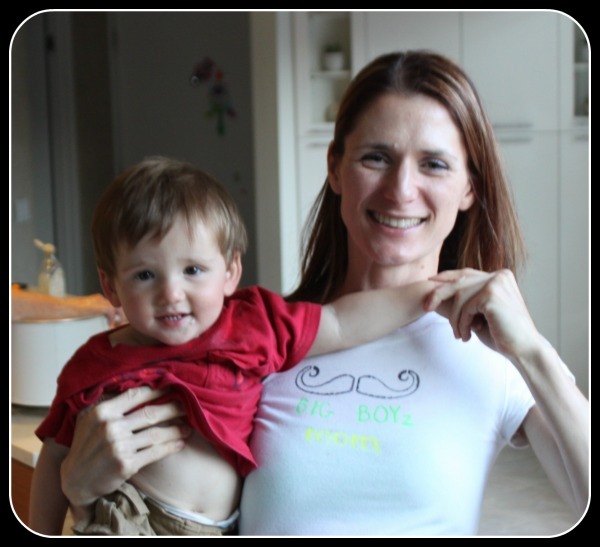 I had an inner turmoil going on from the moment I had my first child. My heart wanted three kids. My head thought my heart was crazy. Should I have three kids. Can I handle three kids. One kid is hard. Two kids is really hard. Maybe I'm not cut out for this. Didn't help that I was suffering severe burn out around the time I had "planned" to start trying for a third. Luckily, I listened to my heart and my burn-out had lifted enough that we did decide to go for number three. Now my heart is happy. My heart was right. He was meant to be with us. So we had to have a big celebration of his birthday. A Big Boy Celebration. With lots of Mustaches. And it had to be a celebration that my daughter could partake in. Namely she needed to eat the cake. Because that girl loves cake. And she can only eat cake that is gluten, egg and dairy free. Since I'm still recovering from my brother's wedding I wanted to do a boxed cake. So I bought the Betty Crocker Gluten Free cake. It calls for water, butter and three eggs. Hmmm, obviously some experimenting needed to happen. I modified the recipe (ignoring the instructions completely) to use 1/2 cup of unsweetened almond milk, 3/4 cup of Chia gel (about 3 tbsp ground Chia with just under 3/4 cup of water) and 1/2 cup of butter. It wasn't quite dairy free but two out of three ain't bad. I will try this again with coconut oil instead of butter to make it dairy free. Next time. UPDATE: I made these again using Coconut oil instead of butter and it worked perfectly. So 100% dairy free. It turned out awesome. It was super moist and ALL the kids loved it! I was so impressed. 1) Make one round (8") chocolate cake. 2) Let cool completely and then freeze. 3) Take out of freezer. Place a piece of parchment paper on top and make a zigzag pattern with toothpicks (see picture). 4) When the cake is partially thawed. Cut the zigzag pattern into the cake. 5) Flip one piece over and join in the center. 6) Ice the cake when it is still partially frozen. I used a fork to make a "hair" design. Done. 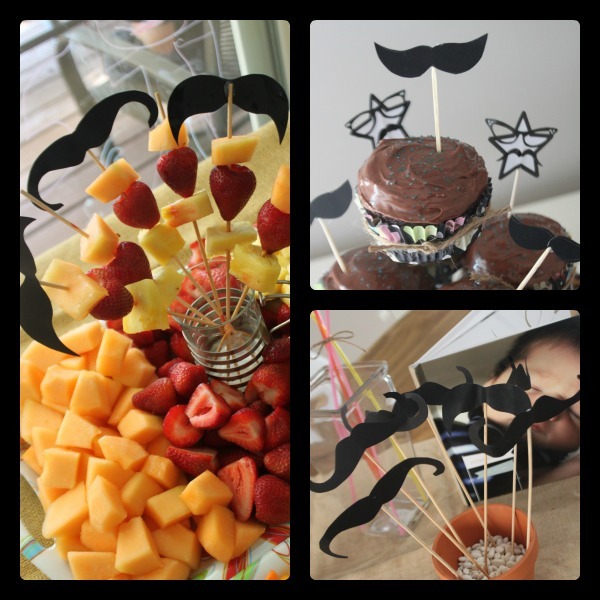 And a couple other ideas if you want to host a mustache party. Because there is just so much you can do with a paper mustache on a stick. Its hard to read but we decorated shirts for the party. Mine said "BIG BOYz Mom". With a mustache on the front and back. Yes. I'm proud to be his Mom. Happy Birthday Little Buddy! I love you. I love us all more because you are with us! Thank you for laughing so much! I love your laugh. I was wondering what you used for the icing? Can't wait to try this recipe. Sounds yummy. Thanks!